Why Live In A Yurt? Continuing my obsession with alternative housing, I thought it was time to dive into yurts. If you haven’t heard of them before, then you’re in a for a treat! Yurts go back thousands of years. They originated in Mongolia and central Asia, and because of their light weight and portability, they’re what the nomads lived in as they traveled through the wilds. Yurts could be easily set up and taken down, and could be pulled on slings by horses. They were essential living spaces for a people on the move. Yurts are still used by families living in central Asia today. They’re basically just one large open space, with a domed roof and viewing hole at the top. The structure in modern yurts is wooden beam and wooden lattice. The outside covering can vary, depending on the manufacturer. Most companies use industrial fabrics that have been weatherized, but some also use exterior wood construction for a more permanent structure. But, don’t think that yurts are flimsy; although the design is simple, yurts are one of the strongest structures ever created. They readily resist wind, rain, and snow, and give the inhabitants a warm, comfortable living space. Yurts stay standing because of two factors: compression and tension. The freestanding walls are kept in place by a steel aircraft cable running around the top (right under where the domed roof begins). But the walls are structurally sound because of the downward pressure that comes from the domed roof. In a yurt, you’ll hear every raindrop, every breeze, every bird call and coyote howl. In high winds your yurt will rock and creak like a wooden sailing ship in a gale. Yet, while reacting strongly to every weather change, yurts handle weather brilliantly. I was inside one day when a 100-mph wind gust hit. The lattice wall swayed. My desk rolled backward, books tumbled from atop a filing cabinet. But when I checked for damage later, I found only that the drip-edge of the roof had harmlessly flipped up-something I could have avoided by using the built-in tiedown loops. The roof and walls have never leaked, even in the worst rainstorm. The roof has never bowed under snow. And I’ve had only minor, fixable problems with cold and moisture penetrating around the bottom. If you’re living in areas of truly extreme conditions, wind and snow reinforcing kits are available. How Much Do Yurts Cost? Here’s where yurts really start to look appealing. Yurts are incredibly frugal to live in. 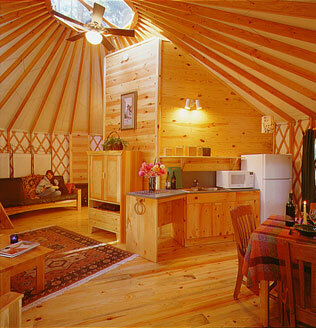 Size- Yurts typically go from a 16′ diameter to a 30′ diameter (or, roughly 300 s.f. to 730 s.f.). Insulation- You can choose no insulation, single layer, or double layer. Windows- Standard yurts have soft, flexible windows that roll up, but you can invest in hard, glass windows as well. Interior Design- You can opt for one large, open space, or divide things up with a loft or interior rooms. Outer covering- You can choose several different types of fabrics, as well as the color you want it to be, or opt for an exterior wood cover that some companies offer. Foundation- You’re also going to have to spend money on some kind of foundation. It doesn’t have to be a traditional poured-concrete foundation, by any means. Many yurts sit on raised beams or some kind of decking. So, what’s the final cost of a yurt? Again, it’s going to vary depending how large and how fancy you want to go, but you can expect to spend $4,000-$20,000 (or more) for a yurt. Is A Yurt For You? Yurts can be used for many different things. Full Time Living In Remote Locations- If you own land that’s far, far away from the things of man, then building a structure onsite is going to cost a small Turkish fortune. When you think about hauling all the materials that far out (not to mention if you’re hiring a construction crew), you’re looking at some serious money. Yurts work great for remote locations because you can throw everything you need on a trailer (or in the back of a large truck, with a few trips) and have everything you need to put it up. Of course, you don’t have to be in a “remote location” to live full-time in a yurt. They work well in any environment. Yurts are very often used as meditation rooms, spas, or spiritual retreat spaces. Why? Well, because there’s just something about the circular, open space that relaxes and rejuvenates us. The circle is considered by many to be a sacred shape, and many people that stay or live in a yurt report that they’re more relaxed, they’re more positive, and they dream more because of their yurt experience. Yurts take us back in time to our ancient roots, roots we might not even realize are there until we step inside one of these structures. It’s a very soothing, positive environment that many people respond immediately to. As you can imagine, living in a yurt means that your footprint on the environment is incredibly small. 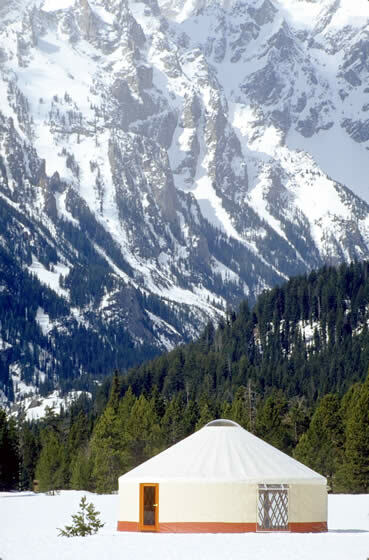 The circular shape especially blends in with the natural surroundings, and if you choose a natural colored fabric your yurt can almost go unnoticed in the background. They’re also incredibly inexpensive to heat and cool. Most yurts use small propane heaters, wood stoves, or pellet stoves as the main heating unit. 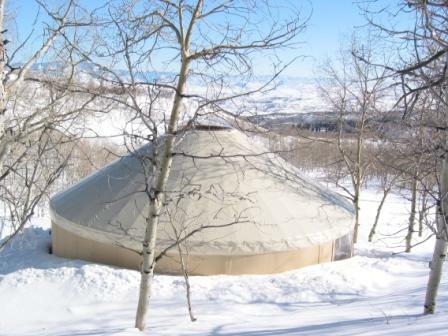 And, YurtInfo.org reports that yurts have 12% less surface exposed to the elements than their rectangular-shaped counterparts, so they’re more efficient to heat in cold climates. And to cool? You simple open the top window, and the windows all along the outside walls. The air exchange is really wonderful in yurts, so they stay relatively cool. YurtInfo.org– Make this site your first stop. Their FAQ page is incredibly thorough, and they have a wonderful “Yurt Classifieds” page where you can find used yurts for sale. Yurts, in Backwoods Home Magazine– wonderful article on yurt living. Topics about Ships » Why Live In A Yurt? What a great article! Thanks for promoting yurt living. It’s a really affordable option that a lot of the general public is still not familiar with. Your writing makes it very appealing and understandable. And thanks for the link to our company Colorado Yurts. If you ever need photos or info for other stories please let me know. We’d be happy to supply them. Again, thanks for the great info on yurts. Anyway, thanks for the bloggage! Thanks for the very interesting article on yurts. I’ve always had a fascination with them. I have read that people have trouble obtaining permits to erect them in a lot of areas. Would love to hear from some people who live in them! I don’t see why they wouldn’t be, but you’d have to call your agent and check. I’m really not sure. I’m planning to move to a yurt full time in the next year or so. From what I have read, you can’t get homeowner’s insurance. I live in a yurt and plan to die here (just not anytime soon), and so far I’ve been unable to get traditional homeowners insurance. So far the best I’ve found is contents, or “renters” insurance. Visit my blog…all about yurts, cooking, homesteading and more. 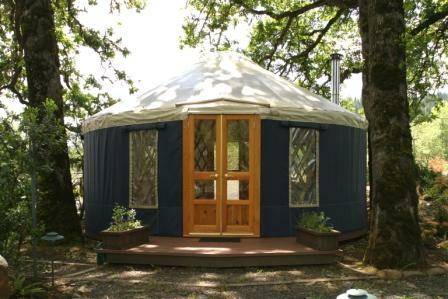 Hello Im just wondering if you have any yurts for sale, or used? 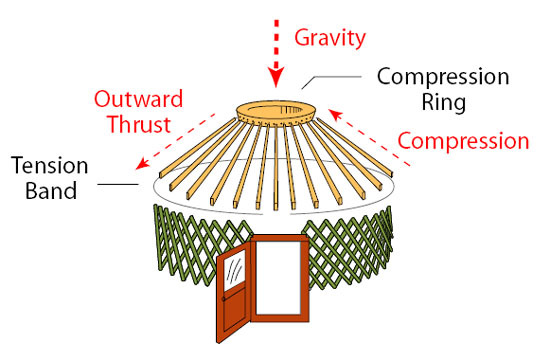 If you are building a panel yurt, it is best not to use the term “yurt” with the building department as they will automatically place it in the category of the canvas or fabric yurts. You should instead use the term “round house”, as this is actually what a permanent round structure is categorized as.